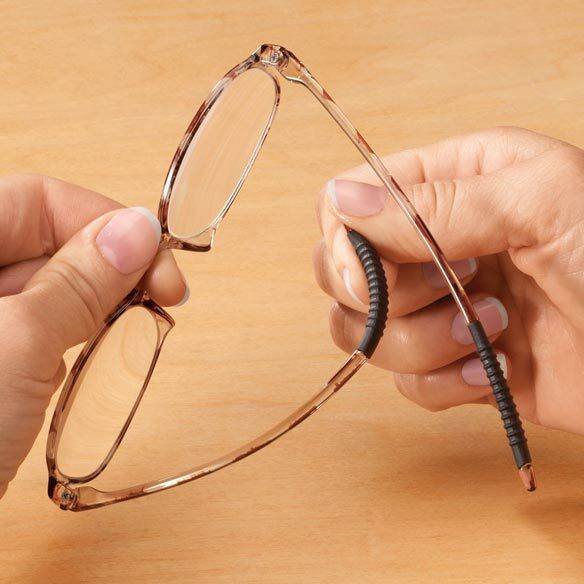 Fashionable readers with flexible bows & ear grippers are available in an array of hard-to-find magnifications. 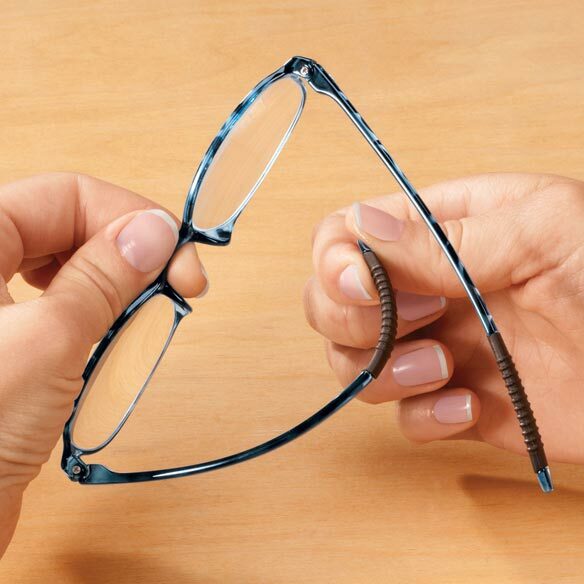 Durable, lightweight frames bend without breaking, contouring to your unique face. Rubber grippers keep the ear pieces comfortably in place without slipping or sliding. With 3 stylish colors to choose from and magnifications all the way up to 6.00x, there’s a perfect pair for any woman. 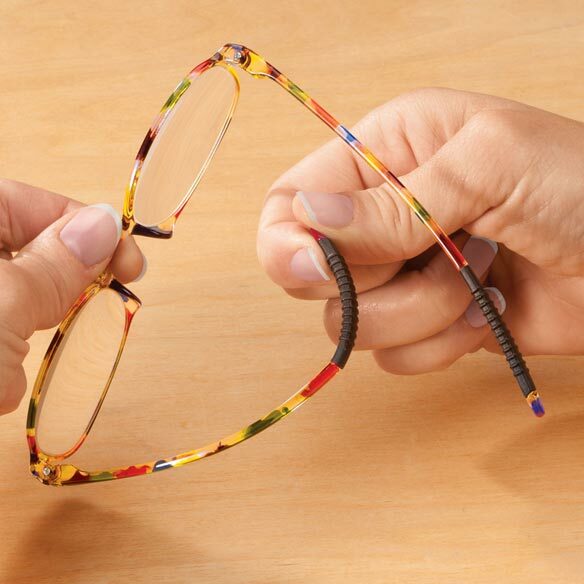 FDA-registered reading glasses flex for a secure, custom fit. Specially designed rubber grip ear pieces stay in place. 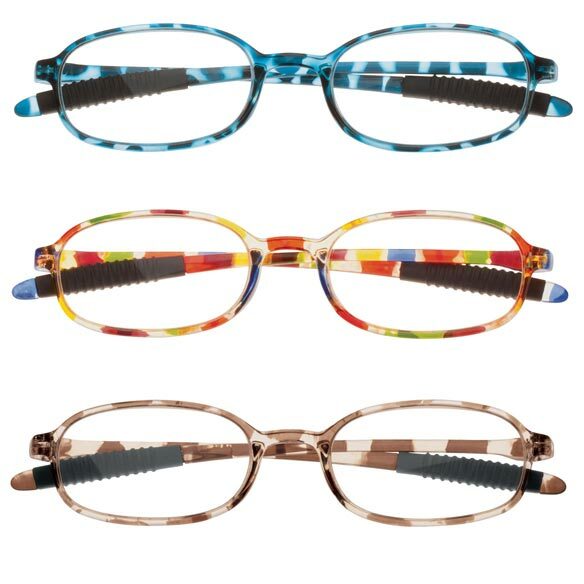 Choose from 3 exclusive colors: rainbow, blue or tortoise. Choose from 1.50x, 2.00x, 2.50x, 3.00x, 3.50x, 4.00x, 4.50x, 5.00x, 5.50x or 6.00x. I am quite pleased with these reading glasses. They don't slip down my nose all the time and they are comfortable to wear. I just received these, put them on and couldn't believe how clear everything was. I have many pairs of readers because the magnification I need is 4.50, so I need to have a pair of glasses handy in every room. These glasses are far superior to any pair I have ever owned, even the expensive prescription ones I have. I use this for reading. It is very reasonable and much better quality than the one you buy at Pharmacy. Comfortable, fun and functional-more colors, please! So far, I like these glasses very much. The flexible sides are comfortable and fit well, and the bridge barely makes marks on the sides of my nose-something I was specifically looking for. The frame pattern is fun and attractive! I'd love to see these in more color choices. The reason for 4 and not 5 stars is that I've only had them a short time and don't know how durable they'll be in the long run. Very comfortable, very clear. Have bought these before and love them. I have worn glasses for 20+ years and I find myself always pushing the glasses up. I am hoping that the rubber on the end ear pieces will stop this. my vision is getting worse and I hope these will help me read more easily. They fit my wide head nicely & don't fall off when I bend over. the nose piece is easy to wear. I had surgery on my cataracts and only need reading help. These loo like they will be perfect. I like the different shap and color. I need an extra pair of glasses. Looking for glasses I can use while lying down - they need to be flexible. They are 6x and this style doesn’t have screws at the nose piece. Have a pair and need an extra pair. These are the best reading glasses I have found in over 30 years of wearing glasses. They are very light weight and comfortable, with crystal clear vision. I have each color, but the multi-colored ones draw the most favorable comment! I bought 2 pair of these last week, and I really love them. They fit well, and I want more of them while they are still available. do you have readers in size 2.75? BEST ANSWER: Thank you for your question. Unfortunately we do not have glasses that are 2.75. We hope this information will be of help to you.